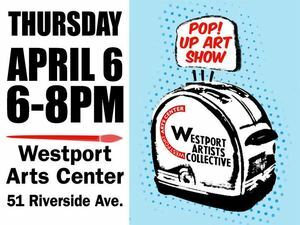 Westport, CT -- Pop into a special Spring Pop Up show by the Westport Artists Collective on Thursday, April 6 from 6 – 8 p.m at the Westport Arts Center. The Pop Up is free and open to the public, and will be on view Thursday, April 6 through Saturday, April 8 (closing at 1 p.m. Saturday). The Westport Arts Center Collective has quickly grown to include 150 members who have joined forces to discuss, create, and develop dynamic art experiences. For more information on the Pop Up Show or the Westport Artists Collective, contact the Westport Arts Center at 203/222-7070 or visit the Arts Center website at www.westportartscenter.org. The Westport Arts Center has completely redesigned its site, making it easier to register for events and learn more about exhibitions – check it out! The Westport Arts Center, a nonprofit organization dedicated to connecting community through the arts, reaches more than 11,000 people annually through outstanding programs in visual arts, arts education, and the performance arts of Chamber and Jazz music. The Westport Arts Center also receives philanthropic support from the Katherine and Howard Aibel Foundation; Artur and Heida Hermanns Holde Foundation, Inc.; AB Bernstein; CBP; Cohen and Wolf, P.C. ; Connecticut Cigar Company; Connecticut Office of the Arts; Delamar Southport; DanceSport; Dragone Motor Cars; Fairfield County Bank; Fairfield County's Community Foundation; Finn, Dixon & Herling LLP; Fleishers Craft Butchery; 4th Row Films; GWAY Marketing Gymnasium; Hal Prince Music; the Hall Art Foundation; The Hofstetter Baron Group; J.P. Morgan; Lillian August; the Mitchell’s Family of Stores; Moffly Media; Newman’s Own Foundation; Random Acts; Rosenkranz Foundation; Saugatuck Grain & Grape; Shack Sackler Foundation; Sontag Advisory LLC; Stamford Tent; Sun Hill Foundation; Verde Energy USA, Inc.; Vespa Restaurant; Wells Fargo Advisors; Westport Now; William J. Rosenbloom Charitable Trust; Xerox Foundation; WPKN and WSHU Public Radio Group. For more information, contact the Westport Arts Center at 203/222-7070 or www.westportartscenter.org. The Westport Arts Center gallery is open Monday – Saturday 10 a.m. – 5 p.m. at 51 Riverside Avenue, Westport, CT.